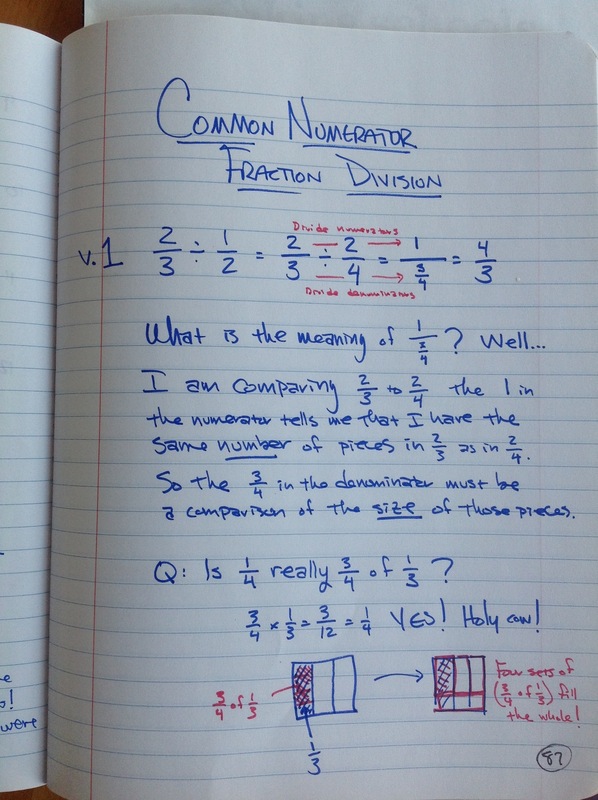 I appreciate Christopher Danielson’s post on common numerator fraction division because it’s important to examine how various algorithms work and how we can help our students become more flexible with their thinking. It’s not surprising that I teach fraction division using rectangles, and I really believe the kids seem to grasp it better because it’s visual. I’ll start with this problem: 3/4 ÷ 2/3. But before we do fraction division, I ask kids about whole number division. What is 8 ÷ 2? What is 15 ÷ 5? Eventually we settle on something like: asking what is 8 divided by 2 is the same as asking how many groups of 2 are in 8. Let’s draw out 3/4 and 2/3 on paper. Half of them draw circles. Awful, drunk, ill-behaved circles. Let’s use grid paper instead to draw our rectangles. I think you can show 3/4 much more accurately on grid paper than on a circle. What size do you think? Does it matter? Shade the first one to show 3/4 and the second one to show 2/3. They mess up. They might draw a 1 x 4 rectangle, shade in 3 to show 3/4. But they don’t quite know how to shade in 2/3 of a 1 x 4. So maybe we should think about the size of the rectangle more carefully. Look at the problem again. Three-fourths divided by two-thirds. Hmmm… What dimensions should our rectangles have so it’s easy to divide into fourths and thirds. This prompt is enough for someone to say, Draw a 4 by 3 rectangle! Bingo! I’m drawing these with you. Okay, so two rectangles of 4 by 3 — or 3 by 4 — doesn’t matter. I’m shading in 3/4 on the first one and 2/3 on the second one. So our question is: How many groups of 2/3 are in 3/4? Because I colored mine in, can you help me ask the question again using colors instead? Someone responds, How many pinks are in the greens? Yeah. And how many little squares are pink? Okay, eight. So, I’m going over to the green here and round up 8 pink squares. I’m able to round up one group of 2/3 (pink) in the 3/4 (green). Someone says, There’s one left over. How much is this one little green square left over worth? Right! 1/8 because we called 8 little boxes as one, so 1 little box must be 1/8. Our answer then is 1 and 1/8. A few students say, I get it. How do we know that our answer of 1 1/8 is correct? Okay, we’ll use a calculator. I purposely use an online calculator where I’m entering the fractions as they appear. I don’t need to distract them right now with decimals or talk about parentheses. This is from CalculatorSoup. Let’s do this again. Now with a mixed number just for fun. Let’s do 1 1/2 ÷ 2/5. How many rectangles are we drawing? What dimensions should they be? Oh, but we have more than 1 whole here, so…? We should have something like this then. They say, How many groups of orange are in blue? So let me round up the groups of orange that are in the blue. I got three. And the leftover is? Right, three. Three out of…? More students say, Three-fourths! Three and three-fourths. I get this! This online calculator from Calcul allows for entries of mixed numbers. Okay, your turn to do one all by yourself. I think these kids’ papers show understanding. While these are not there yet. I don’t know. But it seems that drawing pictures and doing more visual stuff start to disappear in middle school. Below is our textbook’s treatment of “dividing fractions and mixed numbers” — Chapter 5, Section 7 — the full 3 pages before the Exercises. Notice the two circles at the start of the section — that’s pretty much it. And circles are great if you have denominators of 2, 4, and 8. I think if I can get my kids to first see the answer, then I can sell them the other algorithms — like multiply the reciprocal — and not come across as a fraud. I also want to point out that I normally see this visual below for division of fractions. My way is different than this — I deliberately ask kids to draw 2 rectangles whose dimensions are the denominators. Thank you to Rachel Emily Tabak for creating this accompanying worksheet, 18 – Frac division rectangles. This entry was posted in Course 1 (6th Grade Math) and tagged array, fraction division, fractions, rectangle model. Bookmark the permalink. Post a comment or leave a trackback: Trackback URL. Awesome write up. I am particularly impressed by with fabulous job you did making the page do everything you wanted it to, ie, pictures, calculator snap shot, student work and text pages. Thanks for giving me something to think about. Hi Amy. Don’t let Andrew Stadel see your comment. He thinks I’m technologically challenged. (I think he’s not very nice.) I can take pictures with my cell phone and crop. Yes, I can. Thanks, Amy. You’ve gone and done it again! You’ve illustrated an extremely conceptual way to show division of fractions. I’ve shown fraction division in a similar way, but only drew the dividend, not the divisor. The thought process was the same, but the answer didn’t jump out at me as clearly as SEEING the divisor right there. Duh! I also never thought of using graph paper and having the students reason why it’s efficient to use the two denominators as the dimensions of each rectangle that represents one whole. It is SOOO easy to see how many 2/5ths go into 1 1/2! Duh! I’ve been doing this a long time, and every day, following your blog and others, I learn a new approach. I love math! …and your blog! And I sincerely appreciate your enthusiastic support, Elaine! I forgot to include a problem we did where the dividend is smaller than the divisor. We did 2/5 ÷ 3/4. They knew what to draw. So when I threw this slight curve ball at them, some of the kids switched the problem around as if division were commutative! Oy. But I think they got it now. I like your rectangle method quite a bit. Talking about color is very clever as well. What do you think of eventually moving to a 12 x 1 rectangle instead of 3×4, and then moving to the number line as students become more proficient? I like the ease of your method – much easier than a number line approach. But, I also like eventually moving to the number line to more firmly establish the value of the fractions we are dealing with. The Common Core is very big on the number line, and I agree that we need to help kids understand the what/how/where/why of the number line. I just would not teach division of fractions using the number line though, as you say the rectangle is much easier and the answer pops out at them. It would be silly to draw pictures (or use the number line) every time they need to divide fractions, so my use of rectangles is just so they can see the answer for what it is instead of blindly trusting that multiplying by the reciprocal somehow gives the same answer. Earlier this year I had kids order fractions on the number line. It’s tough, but I’m not giving up. I know some teachers are successful with using the number line to teach adding and subtracting integers. Thanks so much! The rectangle method has cleverly and convincingly turned 3/4 divided by 2/3 into 9 divided by 8. I like that simplicity and think this is an excellent method. But, I also think this method allows students to avoid thinking of 3/4 & 2/3 as values. I doubt the students are thinking of the areas of the rectangles as 1 and the areas of the squares as 1/12 – i.e. thinking of 3/4 & 2/3 as values. After awhile, if you use two 1×12 rectangles instead of two 3×4, you have almost moved to thinking of fractions as lengths. Put those two 1 x 12 rectangles right above a number line (between 0 & 1) and you pretty much have the number line approach. Now it is clear that the length of each rectangle is 1, the length of the green part is 3/4, the length of each square is 1/12, where these values are relative to 0 & 1, etc. I don’t know when or if the number line should be brought in for dividing fractions. But, I see a lot of students that don’t really seem to think of fractions as values. As a result, these students have very poor rational number sense. They also often view the same procedures and concepts as completely separate when using rational numbers instead of whole numbers. Anyway, hope this doesn’t come across in a negative way. I wish there were more folks like you putting out really good stuff for the rest of us to steal. Not negative at all! If anything I really appreciate your making me think about this deeply. I also think you’re giving this rectangle thing more credit than it deserves. It is what it is. Not perfect. Not “the” way to teach anything. It’s just my way of seeing things. When kids do not connect the dots, it’s our job as their teachers to help them do exactly that. I’m just having kids estimate a lot too before doing any calculation to build that number sense and operation sense. With fractions, I’m just happy right now that they can tell which fraction is bigger. So if they could tell, then I want them to think about taking a smaller number and dividing by a bigger number — or the money you have to divide up equally among the people is less than the number of people, then how much does each person get? Baby steps. Thanks so much again! This blew my mind. It seems so simple, and yet, I’ve never seen this approach before. And it is SO MUCH BETTER than the textbook version. I don’ know that the textbook makes it obvious that there is 1/3 remaining. Also, I like that you throw those couple of mistakes up there. It makes sense that students would have a little trouble with the 1/3 part. My textbook, after showing the two circles divided neatly into fourths, went right into the algorithm of multiplying by the reciprocal. Blehh. I blew Nathan Kraft’s mind. Woohoo. Thanks, buddy. You and your rectangles. I love it. And this lesson is solid, too. As usual, I’m impressed. Among the locals I’m crowned the Rectangle Queen. Now you know. Thanks much, Matt. Fawn – Thanks so much for sharing. I truly appreciate your ideas and how nicely you lay them out for the rest of us. I spent quite a bit of time with students visually representing division earlier in the year (though I find your way more intuitive). Students seemed to have it. I then “sold them an algorithm” – How do you branch off to the multiply reciprocal algorithm? – and all seemed great. Recently, I worked division back in and a strong student looked at me as if it was never discussed. Makes me feel good…yeah right, but I was wondering if you would go back to rectangles or do what at this point. After the rectangles, I’d show them common denominator division since they’re already finding common denominators for adding and subtracting. I’d also do multiply the reciprocal. These are easy sell after they SEE the rectangles, I think. Thank you so much, Frank, for your kind words. Fawn, this is so great! I’m going to do it tonight with my adult basic math class! And thank you for the extra one in the comments too! Thank you, Debbie, and you’re welcome. From your first example. “Someone says, There’s one left over. Q: Did any of your students say 1/12? I could see that being a common mistake since there is one green square out of the original 12 left over. If so, how did you address? If they did, I didn’t hear them, but for sure in this first example, some are lost and probably thought 1/12. I posted examples of kids not seeing the remainder correctly. It’s emphasizing what we just gathered up and called “one.” We circled 8 boxes and we called that one whole, so 1 of those boxes must represent 1/8. It’s about asking kids to see what was defined as 1. Thanks, Rebecca. Hey Fawn! I opened my review of multiplying and dividing rational expressions with your fraction prompt! I love, love, love that the reluctant mathematicians are the first to answer, “how many one-halves are in three-fourths?” So cool. PS Please put my little prose poem on your summer, let-me-get-sleepy-before-bed reading list! This is indeed beautiful stuff. I like the suggestion of eventually turning these into 1 by (common denominator) rectangles to make the connection to the number line (and help explain the method whose illustration you show at the very end). I also wonder why textbooks seem so focused on showing just one method. Mostly I think it’s because 50 years ago, we needed kids to learn the most computationally efficient method we could find, so that they could compute quickly. Now if we want quick computation, we use a calculator, and so it’s time for curricula to adapt by showing methods like yours that help kids understand more instead of focusing so much on efficiently reaching answers. Tatiana would be so happy to see more kids working with grids! For the last 9 years I’ve required my students to keep a quadrille-ruled composition notebook and much of our work is also done on graph paper. But if you see Tatiana, please let her know that I think of her often when we use grids. This is beautiful, it makes fractions so workable! Excellent job, and thanks for sharing! Using rectangle area models to teach fraction operations is one of the best models I have ever used with students. I was introduced to this model in the early 1980s by a professor at Ball State University (in Indiana). She used a 11 pin by 11 pin geoboard and geo-islands (since her death in 1987 the pieces were sold as fraction islands). Algebra through Visual Patterns put out by the Math Learning Center (Portland, OR) is one of the best workshops I’ve attended. That really was the first time I started using rectangular models and really never looked back. Thank you, Roger. Yay!! Thanks for telling me that, Jess. btw, i faced question when the the first fraction is smaller then the 2nd one. how to solve it? it’s okay. i guess i already know the answer when i look through again ur explanation. just that it’s quite hard for me to explain well to my students .. Tq anyway! Do you have a good way of using the rectangles to show why “invert and multiply” is a convenient “shortcut” for doing fraction division, once they get what it means? Hi mathmom. The rectangles serve as a visual model for fraction division, but to explain why “invert and multiply” work, I’d go back to using unit fractions and the language of division. For example, 6 divided by 1/3 can be asked as “how many unit lengths of 1/3 [on the number line] are in 6 units?” This question can be translated to the multiplication problem of 6 = ? x 1/3, or “how many copies of 1/3 to equal 6?” Students reason that it takes 3 copies of 1/3 (definition of a third) to make 1 whole, so 6 x 3 = 18, and this product 6 x 3 is the solution for the 6 divided by 1/3. With ample opportunities to work and reason about these problems, students will see why “invert and multiply” works. I guide them through this process: Let’s draw out 3/4 and 2/3 on paper. The partitive method, as an alternative, is good from the point of view of drawing a picture and seeing what happens. The following works a lot better with diagrams. Take 3/2 ÷ 2/5 = ? Its the same with whole numbers, for example 3 ÷ 2 = ? Fraction is already taught in elementary grades and it is also part of our everyday’s life. But sometimes we cannot escape some situations where we have to solve complicated fraction problems like adding and subtracting mixed fractions. To make sure that my solution is correct I used mixed number fraction calculator as a guide so that I can avoid some mistakes. Making mistakes in real life really cost a lot and mind draining. Just like dividing the inheritance which involve a lot of fractions, we have to be sure that everything is correct to avoid further problems. Hi Sarah. Sorry, we no longer have that textbook, that was two textbooks ago, and I believe it was published by McDougal Littell.